Today I’ve got a recipe for you for when you want to order an Indian takeout, but it is the end of the month and you are waiting for payday. These crispy samosas are incredibly easy to make and using shop pilau rice, or leftovers from our easy pilau rice, a packet of filo pastry and some frozen peas. I’ve served them with a spicy, sweet yoghurt dip, but they would be equally good with chilli sauce, chutney or even a flavoured mayonnaise or ketchup. If you use a leftover packet of coriander from the depths of your freezer you can make about 40 of these for £4. These are also perfect for canapes at a party. These samosas do require a little bit of time, and some origami to put together but once you get into the swing of them they are really quite fun to make, and it is something that older children will enjoy making with you. Adapt the fillings to suit you and your family’s taste; as well as the peas you can add sweetcorn, diced peppers, leftover chicken etc to the filling – just chop everything up finely and mix in well with the rice. Arrange any spare samosas onto a baking tray, freeze, pack into plastic boxes and then cook from frozen for about 25mins. Or make just a few and use the reminder of the rice to go with a homemade curry, and use the filo as a pie topping, or for simple strudels. 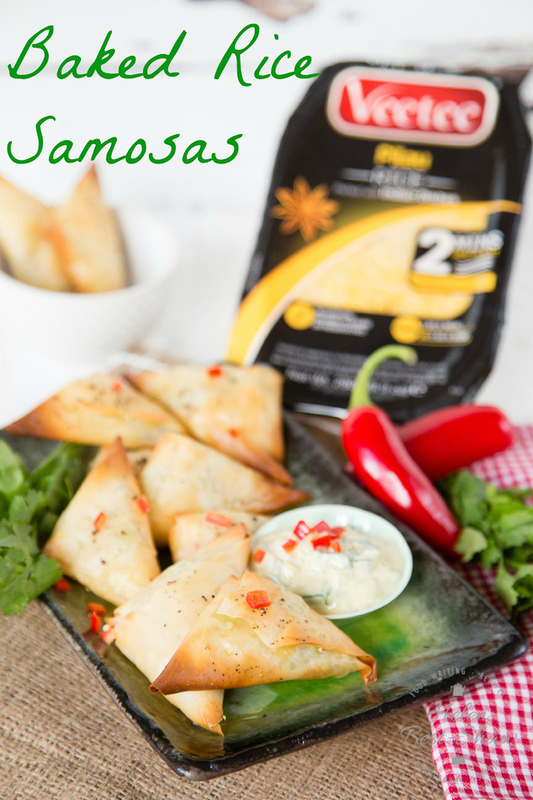 If you try this Recipe: Easy to Make Baked Rice Samosas please tag #FussFreeFlavours on Instagram or Twitter. It is amazing for me when for me when you make one of my recipes and I really do love to see them. You can also share it on my Facebook page. Please pin this recipe to Pinterest too! Thanks for reading Fuss Free Flavours! 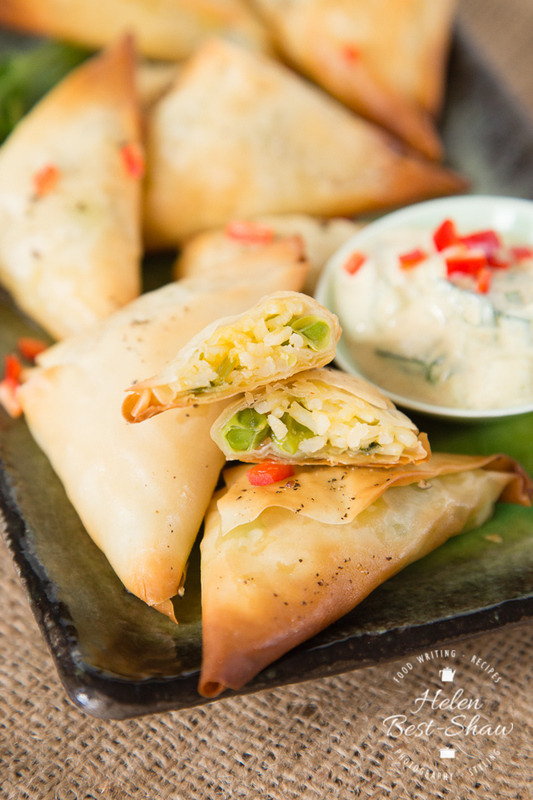 Easy to make crispy baked samosas filled with rice and peas, served with a fruity yoghurt dip. Mix the Veetee rice, peas, coriander and chilli together in a bowl. Open the packet of filo pastry and cut into strips about 6cm wide and about 24cm long - the short edge of most ready made brands is about the right length. Cover the pastry that you are not working with with a damp tea towel to keep it from drying out and cracking. Take one strip of filo and brush it with melted butter, put a teaspoon of the rice mix onto the pastry and fold it up into a triangle shape, following the photos below. Add some extra butter to stick the flap down. Carefully place the finished samosa onto a baking tray. Once you have finished folding brush all the samosas with melted butter, turn them over and brush with butter again. Bake at 180C fan / 200C / Gas 6 for 15 - 20 minutes until golden brown and crisp. Sprinkle the chopped cucumber with salt to draw out some of the liquid and leave in a sieve for 10 minutes. Mix all the other ingredients together, add extra chopped chilli and curry powder is desired. Place the cucumber onto a clean tea towel and give it a really good squeeze to dry out the cucumber out a little. Stir the cucumber into the yoghurt dip. 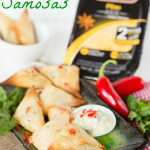 Serve immediately with the freshly baked samosas.